Kindly refer to the Lok Sabha Bulletin Part II Nos. 4687-4695 Wednesday, November, 21 2012 and the discussion your office had with us in the matter The Government has proposed to move two resolutions i.e. No. 4693 and 4694. As desired by you we send herewith the draft of the counter resolution to be moved by you in the matter. Against Resolution No. 4693: Text of the Counter resolution. From whom received. Ministry concerened. Shri Basudeb Acharya. Finance. This house disapproves the proposal of the Government to reject the award given on 24th November, 2005 by the Board of Arbitration in CA Reference case No. 3 of 2004 regarding revision of rates of transport allowance to the Central Government employees as the expenditure to be incurred is not going to be Rs. 1232 crores. The increased allowance is to be given for only two months i.e. November, 2005 and December, 2005 as Transport allowance at much higher rates has already been paid from 1.1.2006 onwards. Against Resolution No. 4694. Text of the Counter resolution. Shri Basudeb Acharya. Finance This house disapproves the proposal of the Government to reject the award given on 6.4.2004 by the Board of Arbitration in CA reference case No. 2 of 2002 regarding grant of house rent allowance to the Central Government employees for the period from 1.1.2996 to 31.7.1997 at pre revised rates but with reference to revised pay. This is only a one time expenditure for the period of 19 months and logically to be related to the revised pay as was obtaining at the relevant point of time. Since this expenditure will be met from the savings in the Budget under the head Salaries no diversion of any funds are to take place. The Confederation of Central Government employees and workers, the apex level organisations of Associations/Federations/Unions of CG employees other than those working in the Railways and Defence had to take a decision to call upon its members to organise a day's strike on 12th December, 2012 due to the persisting nugatory attitude of the Government in settling the long pending demands. The Government has almost shut down all negotiation in the JCM forum in so far as employees of the departments who we represent are concerned. The Departmental Council meetings are not convened for decades; with the result none of the issues could be even discussed. The demands inter alia include the scrapping of the new pension scheme; withdraw the PFRDA Bill; reintroduce the universal Public distribution system to help out the workers and other poor people; stoppage of outsourcing and the consequent contractorization; regularisation of the casual and contingent and daily rated workers and the Grameen Dak Sewaks whose number has increased phenomenally in the last two decades; setting up the 7th CPC for wage revision which has become due on 1.1.2011(having completed 5 years since the last revision in 2006); removal of the arbitrary restrictions on compassionate appointments; revival of the negotiating forum i.e. JCM etc. We send herewith an explanatory Note on these demands in pursuance, of which we are organising the strike on 12th December, 2012. We shall be grateful for your support and solidarity to make our struggle successful. We shall also be thankful if you will kindly take up our demands with the Government for settlement. The Confederation of Central Government employees and workers is the apex level organisation of all Federation/Association/Unions of CGEs other than in the Railways and Defence establishments. In our last National Council meeting, we were constrained to decide to call upon our members to organise a day's strike on 12th December, 2012 in pursuance of a 15 Point charter of demands. As you are aware, it was in the wake of a strike action in 1960s by the Central Govt. Employees, the Govt. of India set up permanent negotiating machinery called JCM so that the employees will be able to raise their demands and grievances and seek settlement thereof through dialogue. This machinery has now come to a standstill as the Govt. does not convene the meetings of the councils at the Departmental levels on one pretext or the other. A new set of rules were promulgated in 1993 to grant recognition to Service Associations. Many Ministries, despite the employees organizations abiding by the stipulated conditions, have not afforded recognition to the Associations/Federations, thereby closing all channels of communication. The JCM had the facility of referring the issues on which the Government could not agree upon to the Board of Arbitration. The decision/award of the Board was binding on all parties. However, of late the Government had been rejecting the awards in favour of the employees on the specious plea of adverse impact on national economy by presenting resolutions in the Parliament. We need not emphasise the unethical character of this approach which undermines the confidence of the employees in the fairness of the system. Two such awards have been moved for rejection in this session of the Parliament. The 6th CPC recommendations and its implementation had given rise to various anomalies. The employees genuinely felt that the said anomalies would be removed through discussions for which the Government had set up a committee. The Committee despite meeting on four occasions had not been able to settle the issues; nor could it be referred to the Arbitrator. The 6th CPC recommendations were implemented with effect from 1.1.2006. The revision of wages was due on 1.1.2011. The Government has not so far come forward to set up the 7th CPC. The new contributory pension scheme was introduced by the Government on the plea that the pension liability has become unbearable and is a drag on the exchequer. In our Memorandum to the Prime Minister, we had raised several issues and had pointed out that the financial outflow on account of the new scheme will be much more than the existing defined benefit scheme. We had indicated in our memorandum quite a number of aspects which would be detrimental to the interest of workers. We were not even favour with a reply to our memorandum. Recently the Union Cabinet has decided to allow FDI in pension fund operations. This will only result in the flow of Indian Savings for investment outside the country. The PFRDA Bill is slated as Item No. 8 for the consideration of the Parliament in this session. The real intent of the bill is reflected from the decision taken by the Union Cabinet to allow FDI in this Sector. This bill being not in the national interest must not be allowed to become an Act. We enclose an explanatory Note on our charter of demands, which include setting up of the 7th CPC for wage revision, regularisation of GDS as Postal employees, raising the Bonus ceiling in the case of GDS on par with other workers in the country, removal of restriction of compassionate appointments, withdrawal of PFRDA Bill and grant of defined benefit pension to all Central Govt. employees; acceptance and implementation of the awards of Board of Arbitration, revival of public distribution system for making essential commodities available to the people at affordable prices; vacation of victimisation in the IA&A Department etc. We seek your solidarity and support and request you to kindly raise these issues in the Parliament and ask the Government to settle the demands of the Government employees. We write this to request you to kindly intervene and take up the issues/demands and grievances of the Government employees with the Government. As you are aware, the Government had been systematically and continuously shedding its functions since 1991. This policy decision has resulted in outsourcing many of the sovereign functions of the Government. Presently as much as one third of the manpower employed by the Government is casual/contingent/daily rated or contract workers who are given pittance of emoluments. Half of the workforce of the Postal Department, (which employs more than three lakhs of employees,) is Grameen Dak Sewaks. They are not even treated as Government employees. For decades they work on hourly rate salary system. Both the GDS and the other casual workers are employed for carrying out permanent and perennial nature of work. The Government thus violates the laws of the land with impunity. No scheme is in vogue today for their regularisation. The Govt. refuses to induct them as regular employees even after decades of service to their credit. The Government employees were entitled for a statutory defined benefit pension scheme. The Government has denied it to those whoa re recruited after 1.1.2004. The post 2004 entrants are brought within the purview of the New Contributory Pension scheme, thereby making their pension entitlement subject to the market vagaries. The reason adduced by the Government for effecting the switch over from the defined benefit scheme to the defined contributory scheme was the increasing financial burden on account of the pension liability. The Committee set up by the Govt. to go into the matter itself has opined that the new contributory scheme would only make the financial burden to increase further. The Union Cabinet has now decided to allow FDI in Pension fund operations. This will pave way for the foreign monopoly houses to garner the savings of Indian people and maximise their profit. The real intent of brining in the PFRDA Bill has become unambiguously clear from the decision of the Union cabinet to allow FDI in pension fund management. The negotiating machinery which was set up by the Government in 1964 to address the issues and grievances of the Civil servants called the JCM in the wake of the 1960- strike has been made non functional for the Govt. do not convene its council meetings, especially at the Departmental levels. Even when it meets occasionally, the art of procrastination prevails. The machinery had a dispute settlement mechanism whereby the issues on which the Government could not agree could be referred to the Board of Arbitration, whose decision was to be final and accepted by both the parties. There are presently seventeen awards given in favour of the employees. The Govt. has decided to move resolution in the Parliament to reject every one of them. Two such awards are coming up for rejection in this session of the Parliament. There are very many other issues, which are of extreme concern to the employees' viz. the never abating rise in prices of essential commodities, the restoration of compassionate appointments; the overdue wage revision; the untenable vindictive actions against the union functionaries especially in the Indian Audit and Accounts Department etc. Having failed to reach any reasonable settlement through dialogue the Confederation in its last National Council meeting was constrained to take decision for a one day token strike on 12th December, 2012 in pursuance of the 15 point charter of demands. We send herewith a copy of the Explanatory Note on these demands. We once again request you to kindly intervene and persuade the Government to settle these issues. Item No. 1. Revision of wage with effect from. 1.,01..2011. The present wage structure of the Central Govt. Employees has been made on the basis of the 6th Central Pay Commission's recommendations. The 6th CPC introduced a new concept in the form of Pay band and Grade Pay. The recommendations of the Commission were implemented with effect from 1.1.2006 in the case of Pay and in the case of allowances with effect from 1.9. 2008. In the case of Central Public Sector undertakings, the wage revisions normally takes place after every five years. The 5th CPC in the case of Central Government employees recommended wage revision in every 10 years. In the past wage revision has been linked to the extent of erosion of real wages. The degree of inflation in the economy determines the pace of erosion of the real value of wages. The retail prices of those commodities which go into the making of minimum wages have risen by about 160% from 1.1.2006 to 1.1. 2011, whereas the D.A. compensation in the case of Central Government employees on that date had been just 51%. It is also an acknowledged fact that the 6th CPC had computed the minimum wage by suppressing the retail price of these commodities in the market on the specious plea that official statistics of the retail prices of these commodities were not available. They therefore, computed the retail price by increasing the wholesale price by 20% for each of the commodity whereas the actual retail price in the market was 60% more than the wholesale price. While in the case of Group B,C & D employees, the Commission applied a multiplication factor of 1.86 for arriving at the revised pay structure, in the case of Group A Officers, the factor was ranging from 2.36 to 3 times. In the matter of fitment formula also, unlike recommended by the 5th CPC, the 6th CPC adopted varying percentages whereby the officers in Group A were given rise extending from 42 to 49%, whereas the employees in Group B,C,D were granted only 40%. While implementing the Commission's recommendations, the Government further accentuated the discrimination further. The recommendations of the 6th CPC when implemented gave rise to very many glaring anomalies. They were assured to be looked into and settled through negotiations in the JCM. The effectiveness of JCM as a potent forum to settle issues has been eroded over the years. Thus, though the National Anomaly Committee met 4-5 times, it could not settle any major issues. The minimum wage determined by the 6th CPC was at a far lesser amount than what an unskilled worker is entitled to. Morevoer, the Commission assigned the so determined minimum wage to be the wage of a skilled worker.. It excluded persons below matriculation qualification from the purview of Government employment. In a country where one third people are illiterate, such controversial recommendations have only gone to absolve the State from its solemn responsibility to provide employment to the persons at the lower strata of the society. The wage structure evolved by the 6th CPC deviated drastically from the concepts emerged from the deliberations over decades in the matter of wage determination of civil servants and is beset with innumerable anomalies necessitating a thorough overhaul , which can only be attempted by setting up another Commission with appropriate terms of reference. The Grameen Dak Sewaks were excluded from the purview of the 6th Central Pay Commission as the Postal Department took an erroneous view that they are not Central Government employees. The 4th CPC had categorically stated that they ought to have been included within the purview of the Commission's jurisdiction but chose to go by the Postal Department's decision ultimately. the GDS constitute the largest chunk of the Postal Workers. The exclusion of GDS from the purview of the Pay Commission being unjust, discriminatory and bereft of any logic, the next Pay Commission when it is set up must have the jurisdiction to recommend on wage structure and service conditions of the GDS. Wage revision in all public Sector undertakings through Collective bargaining takes place once in five years. On the same analogy, the wage revision of the Central Government employees must be after every five years and the Government must therefore set up the 7th CPC immediately. The wage revision of the Central Government employees had always been through the setting up of Pay Commissions. Since the wage revision exercise involves inquiring into various aspects of wage determination and service conditions of the Government employees the Government had been appointing Pay Commissions for it was considered a better suited system. Such inquiry through setting up of Commissions had been a time consuming process. The 3rd, 4th and 5th Central Pay Commissions had taken more than three years to submit their reports. The 6th CPC however, submitted its report in the time frame provided to it i.e. 18 months. Since the earlier Commissions had covered many aspects of the principles of wage determination and the periodicity of such revision had come down, the exercise might not now require a longer period of time as was the case earlier Even then the Commission will have to be given a reasonable time frame to go into the matter judiciously for the 6th CPC recommendations when implemented has given rise to large number of anomalies and cadre reated grievances. The methodology adopted for compensating the erosion in the real value of wages in the in the interregnum period had always been though the mechanism of merger of a portion of DA. The 5th CPC had recommended that the DA must be merged with pay and treated as pay for computing all allowances as and when the percentage of Dearness compensation exceeds 50%. Accordingly even before the setting up of the 6th CPC the DA to the extent of 50% was merged with pay. 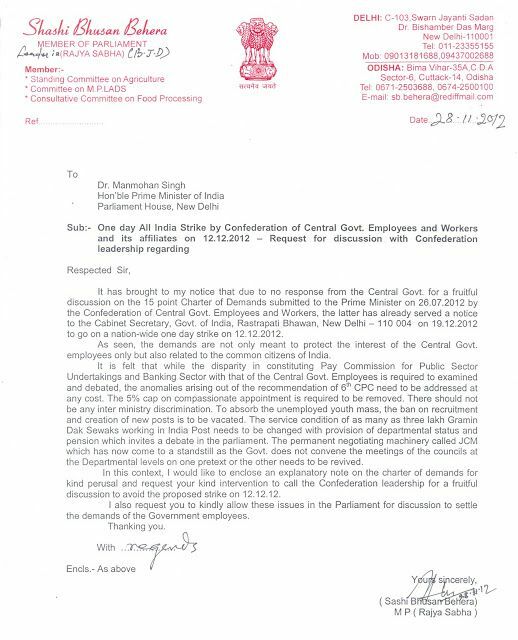 It is pertinent to mention that even this benefit was denied to the GDS. As on 1.1.201, the Dearness compensation was 65% The suggestion for merger of DA to partially compensate the erosion in the real wages was first mooted by the Gadgil Committee in the post 2nd Pay Commission period. The 3rd CPC had recommended such merger when the Cost of Living index crossed over 272 points i.e. 72 points over and above the base index adopted for the pay revision. In other words, the recommendation of the 3rd CPC was to merge the DA when it crossed 36%. The Government in the National Council JCM at the time of negotiation initially agreed to merge 60% DA and later the whole of the DA before the 4th CPC was set up. The 5th CPC merged 98% of DA with pay. It is, therefore, necessary that the Government takes steps to merge atleast 50% of DA with pay to compensate the erosion of the real value of wages immediately. On the plea of a Supreme Court directive, Govt. introduced a 5% ceiling on the compassionate appointments. When the matter was taken up by the Staff Side in the National Council the Government was unable to produce any such direction of the Supreme Court.. Despite that, the official side refused to withdraw the said instructions limiting the appointments to 5% of the available vacancies. In one of the National Council meetings, presided over by the Cabinet Secretary solemn assurance was given to the Staff Side that the issue will be revisited in the light of the discussion, but nothing happened thereafter. It is pertinent to mention in this connection that the compassionate appointments in the Railways continue to be operated without any such ceiling. In the Department of Posts hundreds of candidates selected by Selection Committee were denied jobs. The list of selected candidates was scrapped. These candidates approached the Court and obtained a favourable order.But the Court directive was not acted upon. The Government has chosen to dilly dally by filing SLP in the Supreme Court. When the Central Administrative Tribunals were established, it was with the intent of expeditious settlement of disputes on service matters. Even recently the Prime Minister's office ordered that it would not be open for various Ministries to appeal against the orders of the Tribunal as a matter of course and efforts must be to explore the ways of acceptances of the judgements of the Tribunal. In the light of this directive, the SLP ought to have been withdrawn. The standing Committee on Department of Personnel in one of their report has termed the scheme of Compassionate ground appointments as a sacred assurance to a fresh entrant that if he dies in harness, his family shall not be left in lurch. Such an assurance is being breached by the provisions of limiting such appointments to 5% of vacancies. This condition, therefore, must be done away with. The postal Department employs the largest number of Government employees, next to Railways and Defence. Nearly half of its workforce is called the Grameen Dak Sewaks, the new nomenclature given for the Extra Departmental Agents. The system of EDAs was evolved by the British Colonial Government to sustain a postal system at a cheaper cost especially in rural areas. Despite the enactment of very many legislations to prohibit the exploitation of workers, the Government continued with this system. No doubt in the post independent era, at the instance and persuasion of the Unions of regular employees, certain benefits were accorded to them. Till 1963, the GDS or the Extra Departmental Agents were treated as Government employees and were covered by the service conditions applicable to civil servants. However, the Department of Post reversed this position thereafter and contended that they are not Central Government employees. The Honourable Supreme Court in 1977 declared that they are holders of Civil Posts. Justice Talwar Committee appointed by the Govt. to look into the issues pertaining to GDS declared that the GDS are holders of Civil posts and all benefits similar to regular employees must be extended to them. 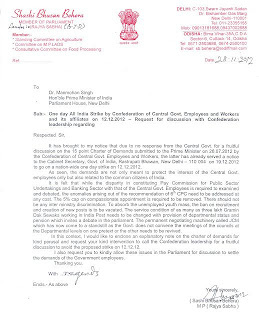 However, the Government did not accept this recommendation of the committee which they themselves set up. On the specific suggestion of the Postal Department, the Government set up a separate Committee called the Natarajamurthy Committee to go into their service conditions and suggest improvement on the lines of the recommendations of the 6th CPC. The recommendations of this Committee were totally disappointing and the GDS in the post 6th CPC era is worse of. Instead of utilising the service of GDS for the welfare schemes of the State in rural areas by converting them as regular employees, the Department caused injustice to them by acting upon the recommendations of the Natarajamurthy Committee. Recently, the Postal Department has decided that the vacancies in the Cadre of Postmen, and MTS would not be fully made available for promotion to the GDS and an element of open direct recruitment has been introduced. This has decelerated the meagre chance of the GDS being a regular Postal employee further. In order to ensure that their grievances are properly addressed, the Postal Department must be directed to earmark all the existing vacancies in the cadre of Postmen and MTS to the eligible GDS for promotion and a scheme is evolved to absorb the GDS as regular full time Government employees. Item No. 4(b) Regularisation of daily rated workers. Regularisation of Casual/Contingent/daily rated workers. Due to the ban on creation of posts and recruitment of personnel that continued for a very long period and the consequent strain on the existing workers, many Departmental heads had to recruit personnel on daily rated basis or as casual workers. Thus,almost 25% of the present workforce in Governmental organisations are casual workers deployed to do the permanent and perennial nature of jobs, contrary to the prohibition of such unfair labour practices by the law of the land. In Fifties and Sixties, even the casual workers who had been employed to do the casual and non perennial jobs used to get priority for regular employment as and when vacancy for such permanent recruitment arises. Thousands of persons are now recruited as casual workers and kept as such for years together. They are paid pittance of a salary with no benefits like provident fund, dearness allowance, other compensatory allowances etc. In order to ensure that they do not get the benefit of regularisation, these workers are technically discharged for a few days to be employed afresh again. The modus operandi differs from one department to another. While in some organisations, they are recruited through employment exchanges in others the functions are contracted out. Not only the quality of work suffers but it is also an inhuman exploitation of the workers given the serious situation of unemployment that exists in the country. While the permanent solution is to sanction the necessary posts and resort to regular recruitment, the Government should evolve a scheme by which these casual/contingent/daily rated workers are made regular workers with all the concomitant benefits available for regular Government employees. Pending finalisation of such a scheme for regularisation, the non regular employees recruited for meeting the exigencies of work must be paid pro-rata salary on par with the similarly placed regular employees on the principle of equal pay for equal work. Item No.5. Functioning of the JCM. It was in the wake of the indefinite strike action of 1960, the JCM was set up as a negotiating forum to expedite settlement of demands and problems of employees. On the pretext of the promulgation of the new CCS(RSA)Rules, most of the departments suspended the operation of the Departmental Councils. Even after complying with the requisite formalities, in many departments, Associations/Federations are yet to be recognized. Wherever the recognition process was completed and orders issued granting recognition, no meetings of the Departmental Councils are held. Inspite of raising the issue in the National Council on several occasions by the Staff Side, nothing tangible has been done to ensure that the councils are made functional. The National Council is, as per the scheme, to meet once in four months. It meets after several years, the system of concluding on the agenda in the meeting in which it is raised has been totally abandoned with the result that number of issues have been kept pending for indefinite period of time. The non- functioning of the Council and the consequent non- redressal of grievances has led to agitations including strike action in many departments. The 6th CPC recommendations were given effect to in September, 2008. The anomalies arising therefrom (which is in large numbers) ought to have been settled as per the agreement by Feb,. 2010. Barring one or two items, no settlement has been brought about on a large number of anomalies till date. In the wake of the General Strike action on 28th Feb. 2012, the Joint Secretary (Estt.) in the Department of Personnel wrote in her demi-official communication addressed to all Secretaries of the Government of India as under, which is contrary to facts but also misleading too. "Joint consultative machinery for Central Government employees is already functioning. This scheme has been introduced with the object t of promoting harmonious relations and of securing the greatest measure of co-operation between the Government, in its capacity as employer and the general body of its employees in matters of common concern, and with the object further of increasing the efficiency of the public service. The JCM at different levels have been discussing issues brought before it for consideration and either reaching amicable settlement or referring the matter to the Board of Arbitration in relation to pay and allowances, weekly hours of work and leave, wherever no amicable settlement could be reached in relation to these items." The forum of Departmental Councils must be immediately revived in all Departments and made effective as an instrument to settle the demands of the employees. The periodicity in which the meeting of the National Council is to be held must be adhered. The Department of Personnel, which is the nodal department for ensuring the functioning of the negotiating machinery must monitor the functioning of the Departmental Councils of various Ministries and Departments and a report placed in the National Council. The Cabinet Secretary, who is the Chairman of the National Council, is required to ensure that the Council meetings are convened once in four months and the issues raised therein settled in a reasonable time frame. Since the grant of recognition to Service Association is a pre requisite for the effective functioning of the negotiating machinery, the Ministries must be asked to process the application and take decision in the matter within a fixed time frame as the recognition rules have come into existence in 1993 that is about a decade back. In 1993, the Government of India introduced a total and blanket ban on creation of posts. This was with a view to reduce the manpower in the Governmental establishments, for on implementation of the neo liberal economic policies, the Government will be required to close down some of its activities and some others to be shifted to the private domain. In 2001, the GOI issued an executive instruction modifying the complete ban on recruitment that was in vogue whereby various departments, if they so desire, resort to recruit personnel to fill up the existing vacancies, provided they abolish 2/3rd of such vacancies. In other words, the concerned heads of Departments will be permitted to fill up 1/3rd of the vacancies provided they abolish the 2/3rd vacancies permanently. Since it was impossible to carry on the functions assigned to the Departments with large number of vacant posts, they had to implement the above cited directive of the Department of personnel, which was meant to arbitrarily reduce the manpower especially in Group C and D segments. Though the directive was to be applied uniformly to all cadres where direct entry is one of the mode of recruitment, not a single Group A. post was abolished as most of the departments offered to do away with Group C and D posts even in the place of require Gr.A posts. Since direct recruitment is seldom resorted to in Group B cadres, the brunt of the burden of the above cited instruction had to be borne b y the Group C and D cadres in each department. The said directive remained operative for nearly a decade i.e. upto 2010. Such abnormal and arbitrary abolition of posts affected very adversely the functioning of many departments consequent upon which the public at large suffered immeasurably, besides accentuating the unemployment situation to alarming proportion. To cope up with the genuine complaints of the public, most of the heads of Departments had to resort to either outsourcing of the functions or engaging contract workers. The Govt. encouraged this endeavour by providing unlimited funds. In the circumstances, it is imperative that the sanctioned Strength as on 1.01.2001 is restored and the consequent vacancies filled up by a special drive for recruitment. The Government has a time tested and scientific system of assessing the workload and measuring the manpower requirement. This seems to have been presently abandoned and the vacancies barring in a few cases are not being filled up. Even though there had been phenomenal increase in the workload in each department no new posts are created to cope up with the situation. The 6th CPC dealing with the subject has recommended that such ban on creation of posts for a long period is not desirable and the Departments should be empowered to create the need based posts for its effective functioning. The commensurate posts that are needed to cope up with the increasing workload must be sanctioned and recruitment of personnel resorted to so that the assigned functions of each department could be carried out effectively and efficiently. Item No. 7. Downsizing, outsourcing, contractorisation etc. To overcome the difficulties emanated from the total ban on recruitment and creation of posts and more specifically impacted by the 2001 executive fiat of the Govt. of India in the matter, many departments had to resort to outsourcing of its functions. Some were virtually closed down and a few others were privatised or contractorised. The large scale outsourcing and contractorisation of functions had a telling effect on the efficacy of the Government departments. The delivery system was adversely affected and the public at large suffered due to the inordinate delay it caused in getting the requisite service.. The financial outlay for outsourcing of functions of each department increased enormously over the years. The quality of work suffered. In order to ensure that the people do get a better and efficient service from the Government departments and to raise the image of the Government employees in the eyes of the common people, it is necessary that the present scheme of outsourcing and contractorisation of essential functions of the Government must be abandoned.The practice of outsourcing and contractorisation is nothing but a cruel exploitation of the alarming situation of unemployment. The system of outsourcing of the functions seeks to informalise the workforce. The contract/casual workers get not even one third of the salary of the regular work force. They have no social security benefits like pension, provident fund gratuity etc. The CG employees fought against the temporary service rules which was in vogue in sixties and ensured that the recruitment to Government service is permanent and the civil servants are not allowed to be fired at the whim and fancy of their bosses. The outsourcing and contractorisation has paved way for large scale entry of casual workers and has resulted in the reversal of what all achieved in this direction through struggles in the past two decades. Item No. 8. Stop price rise and strengthen PDS. The abnormal and phenomenal increase in the prices of essential commodities is an acknowledged fact. The pursuance of the new economic policies and consequent withdrawal of the universal public distribution system had been per se the reason for such unbearable inflation. The universal PDS which was evolved to protect the food security of common people was an effective instrument not only to arrest inflation but also to ensure that no Indian dies of hunger. Government employees even at the lowest wage structure i.e. the Group D and C employees are presently precluded from the PDS as their meagre wages itself is considered to be above the benchmark of "Below Poverty Line". They are to depend upon the open market for even essential food items, which with their meagre income they are unable to access. It is, therefore, necessary that the universal PDS as was in vogue must be brought back as the market forces have failed to arrest inflation and price rise of essential food items. Item No. 9.Introduction of PLB and removal of ceiling limit. Barring the Railways, Defence production units and Postal Department, Bonus is paid to the Central Government employees on adhoc basis. The 30 days adhoc bonus is the maximum that is provided to them. The 4thand 5th Central Pay Commissions had recommended the introduction of productivity linked bonus scheme to all Departments as is presently the case in the three Departments mentioned above. Even the scheme of PLB is not uniform in as much as the Postal Department introduced a ceiling on the entitled number of days of bonus whereas no such ceiling exist either in the Railways or in the Defence Production organisations. The Government is yet to implement these recommendations even though several rounds of discussions on the subject were held. There is no reason whatsoever, as to why this recommendation could not be implemented. There had been no rise in the adhoc bonus for past a decade even though there had been considerable amount of increase in the case of PLB over the years. The Department of Personnel and Expenditure may be advised to finalise the PLB scheme without further delay for those who are in receipt of adhoc bonus. Even though Bonus Act is said to have no application or relevance to the Productivity linked Bonus or adhoc bonus, the provisions of the said Act is employed to deny the entitled bonus to the Government employees on the basis of their emoluments. The bonus entitlement in both the cases is restricted to the computation based on the notional emoluments of Rs. 3500, while the Postal Department went one step ahead and declared that in the case of GDS, it would continue to be Rs. 2500.The injustice meted out to the GDS in the matter by the Postal Department is highly deplorable. Presently even a casual worker is entitled to get a monthly wage of more than Rs. 3500. The minimum wage as on 1.1.2006 determined by the 6th CPC in respect of Central Government employees is Rs. 7000. By artificially linking the restriction of emoluments stipulated by the Bonus Act, the employees are denied their legitimate entitlement of Bonus. The Bonus entitlement must be computed on the basis of the actual emoluments of an employee. Overtime allowance is seldom given to the Government employees. In case of emergency and in the contingency in which the work cannot be postponed, like that happens in the RMS division of Postal Department, in the Atomic Energy Commission offices or when the Parliament is in session in other administrative offices, employees are asked to do work beyond the stipulated working hours. The Night duty allowance is provided to the employees who are asked to work in the night shifts with certain stipulated conditions. The 4th CPC recommended that since there had been considerable misuse of the provisions relating to the grant of OTA, the Government should find alternative methods to compensate the employees who are asked to work on over time and pending such a scheme being evolved recommended not to revise the rates. However, the Govt.did not bring in any new scheme but issued the directive that the OTA and Night duty allowance will be paid to the employees who are called upon to do overtime or night duty on the basis of the 4th CPC pay structure. This directive is still in vogue. On quite a number of occasions, the Staff Side pointed out the irrationality of the directive of the Government in as much as a person engaged for managing the excess work from outside gets better emoluments than the over time allowance granted to the regular employees. The Government refused to reach an agreement in the National Council on this issue. When the Staff side pressed, the Government came forward to record disagreement and refered the matter to the Board of Arbitration under the JCM. Scheme. The Board of Arbitration having found the unreasonable position taken by the Government gave out the award in favour of the staff and directed the Government to revise the order whereby the allowance will be linked to the actual pay of the Government employees. The Govt. did not accept this award and has approached the Parliament for the rejection of the same. The matter has not yet been placed in the form of a resolution in the Parliament. Despite the fact that the employees had been abiding by the directive of their superiors to be on overtime/night duty, and despite having won the case before the Board of Arbitration they continue to be compensated on the basis of the Notional pay as in 1986. There could not have been a much bigger injustice meted out to the employees. The Government must accept the award of the Board and issue instructions linking the allowance to the actual pay of the employee. There are about 17 awards of the Board of Arbitration given in favour of the employees. On the plea that the implementation of these awards would result in heavy financial outflow, the Govt. has moved resolutions in the Parliament for the rejection of these awards. The fact is that the financial burden on account of acceptance of these awards is meagre. The figures quoted by the official side included the arrears that have become due to the delay in taking decisions. The financial implication is normally computed as a total outlay for a period of a year. The official side has in fact only tried to mislead the Parliament in order to obtain a rejection of the award. A few years back, the staff side agreed to alter the date of implementation of these awards in order to reduce the financial implication. The official side discussed the issue on several occasions but did not conclude with the result that these awards are still pending acceptance of the Government. It is rather unethical and untenable that the Government has chosen to invoke the sovereign authority of the Parliament to deny the legitimate dues of its own employees. Prior to 1998, the Government has not chosen to approach the Parliament once the award is given in favour of the employees and implemented every one of them except in a very few cases. The Government must accept these awards and implement the same for such a direction will bring in confidence in the efficacy of the negotiating forum and a sense of reasonableness in the decision making process. Article 309 of the Constitution makes it incumbent upon the Government of India and the Provincial Governments to make enactments to regulate the service conditions of the civil servants. However, till date no such enactment has either been moved or passed by the Parliament.. The transitory provisions empowering the President of India to make rules till such time the enactment is made has been employed to regulate the service conditions of the Government employees. Once recruited as an employee, the ILO's conventions provide all trade union rights. India is a signatory to those conventions. Despite all these legal and moral obligations on the part of the Government, the Government employees continue to be denied the right to collective bargaining. No negotiation is worth the meaning, if the employees have no right to withdraw their labour in case of a non-satisfactory agreement on their demands. It is this legal lacuna which was employed by the Supreme Court to justify the arbitrary dismissal of lakhs of employees by the Tamilnadu State Government when they resorted to strike action. In the judgment delivered by the Supreme Court, it was observed that the Government employees do not have any legal, fundamental or moral right to resort to strike action. The entire section of the Indian Working Class enjoys the right to strike and an effective collective bargaining system except the Government employees. The denial of the right to strike to Government employees was employed by the British Colonial Rulers as part of the scheme to subjugate the Indian people and to shut out any probable dissenting views within the Governmental machinery. To continue with the same concept is to infer that the Sovereign Republic of India want to follow the archaic rules and regulations conceived by colonial rulers perhaps with the same intent. We therefore urge that necessary legislation affording the right to strike to Government employees may be made in the Parliament. Item No. 13 :Career progression: Grant five promotion in the service career. For the efficient functioning of an institution, the primary pre-requisite is to have a contended workforce. It is not only the emoluments, perks and privileges that motivate an employee to give his best. They are no doubt important. But what is more important is to provide them a systematic career progression. The present system of career progression available in the All India Services and the organised group A Civil services attracts large number of young, talented and educated persons to compete in the All India Civil Service Examination. No different was the career progression scheme available in the subordinate services in the past. Persons who were recruited to subordinate services were able to climb to Managerial positions over a period of time. The situation underwent vast changes in the last two decades. In most of the Departments, stagnation has come to stay. It takes decades to be promoted to the next higher grade in the hierarchy. It was the recognition of the lack of promotional avenue in the subordinate services that made the 5th CPC to recommend a time bound two career progression scheme. However, this has not gone to address the inherent problem of de-motivation that has crept in due to the high level of stagnation. In most of the Departments, the exercise of cadre review which was considered important was not carried out. Any attempt in this regard was restricted to Group A services. The discontent amongst the employees in the matter is of high magnitude today. It is, therefore, necessary that every Department is asked to undertake to bring about a cadre composition and recruitment pattern in such a manner that an employee once recruited is to have five hierarchical promotions in his career as is presently the position in the All India Services and in the organised Group A services. (a) The new pension scheme is going to make social security in old age uncertain and dependent on market forces. (b) The scheme has been compulsorily imposed on a section of employees and hence it is discriminatory. (c) Such scheme had been a failure in many countries including Chile, UK and even USA. In USA entire pension wealth has been wiped out leaving pensioners with no pension. In Argentina the contributory scheme which was introduced at the instance of IMF was replaced with the defined benefit pension scheme. (d) The PFRDA Bill has provisions empowering the Govt. and the Authority to cover employees now left out and to amend the existing entitlements of pension benefits. (e) In majority of the countries, "pay as you go" is the system of pension. (f) The contributory scheme does not give any guarantee for a minimum pension of 50% of the pay drawn at the time of retirement of the employee. Nor does it provide for the protection of his family members in the form of family pension in the event of death. The Supreme Court had declared pension as one of the fundamental rights. The government should therefore retrace from its avowed position, which is detrimental to the interest of the employees and ensure that the employees recruited after 1.1.2004 is covered by the existing statutory defined benefit scheme and withdraw the PFRDA bill from the Parliament. The recent decision of the Cabinet to allow FDI in pension fund operations has made the real intent of the PFRDA bill unambiguously clear. The FDI will facilitate the mutual fund operators to invest the funds outside India thereby making Indian Savings available for development of a foreign country. It is now clear that the decision behind the contributory pension scheme was the pressure imposed by imperialist powers and more specifically IMF. It has, therefore, to be opposed at all cost and with vehemence. The Govt. must not be allowed to go ahead with its intention of induction of FDI in pension fund companies. The one day strike on 12th December, 2012 must be seen as a beginning of the sustained and incessant struggles in the days to come. The Central Government employees are alarmed and distressed over the spree of vindictive actions pursued by various Accountant Generals against the employees of the I A & AD Department. More than 12000 employees have been proceeded against under Rule 14 or 16 of the CCS (CCA) rules. The resort to such vindictive action has been taken by the Administration of the Comptroller and Auditor General of India for the simple reason that the employees together decided to be on mass casual leave demanding the vacation of victimization of the Union functionaries in Kerala, Rajkot, Gwalior, Kolkata, Nagpur, Allahabad etc. The very fact that large number of employees participated in the Mass Casual leave programme is indicative of the fact of the growing discontent against the highhandedness of the Administration. The authorities in the IA & AD have not been permitting the genuine trade union activities for the last several years. No meeting of the employees is allowed if the same is held under the auspices of the recognized Associations, whereas permission to hold cultural shows even during office hours are granted. In the name of discipline, dissenting voice, howsoever genuine they are, is not being tolerated. Despite repeated pleas made by the All India Audit and Accounts Association, the Comptroller General of India did not deem it to fit to intervene and set right the high handed behaviour of the Accountant General Kerala. On his promotion as Principal Accountant General, he was transferred to Hyderabad, where, as per the report, he has continued with his intolerant attitude towards the Association. Permission to hold the General Body meeting, a constitutional requirement and a necessity to abide by the stipulations made by the CCS (RSA) Rules, 1993, was denied to the recognized Association in Andhra Pradesh. The General Secretary and other office bearers of the Association have been proceeded against under Rule 16 for holding the General Body meeting during lunch break. In the background of this unprecedented situation and the blanket ban instituted by the authorities to hold any meeting within the office premises we appealed to the Honourable Prime Minister to intervene in the matter and direct the concerned to hear the grievances of the employees and settle the same in an amicable and peaceful atmosphere. We also requested that In order to create a conducive atmosphere for talks, the authorities may be asked to withdraw all punitive and vindictive actions against the employees who had gone on Mass casual leave as a means of protesting against the inordinate delay in settling issues and to give vent to their feeling of anger. Not only no action has been initiated by the C&AG in this direction but the vindictive attitude of the Accountat Generals continue to persist. The Government is required to interfere and bring about a peaceful atmosphere in this prestigious institution.